Calculate the serum "anion gap"
Discuss causes of an increased "anion gap"
Discuss causes of a decreased "anion gap"
Aldosterone - a mineralocorticoid hormone secreted by the adrenal cortex that influences sodium and potassium metabolism; released through action of angiotensin II. Cirrhosis - progressive disease of the liver characterized by damage to hepatic parenchymal cells. Hypoxia - a condition of low oxygen content in tissues. Juxtaglomerular cells - smooth muscle cells that synthesize and store renin and release it in response to decreased renal perfusion pressure, increased sympathetic nerve stimulation of the kidneys, or decreased sodium concentration in fluid in the distal tubule. A basic understanding of renal and lung physiology is assumed for this chapter. Electrolyte analyses are among the most frequently ordered laboratory tests and an understanding acid-base balance is important to every clinician. Many drugs have a direct effect on acid-base balance while others influence pH through pharmacological mechanisms. Understanding how to interpret blood gas and electrolytes forms the core for the diagnosis and treatment of a variety of pathological states. Plasma: Ammonium heparinate is the preferred anticoagulant. Do not use EDTA, citrate, oxalate or fluoride anticoagulants since these may elevate sodium or potassium if these salts are used; also, some bind Ca++ and Mg++. Serum: Potassium values are slightly higher in serum (0.1 - 0.6 mmol/L) than in plasma because of release of potassium from platelets during clotting. Consequently spuriously high potassium values may be seen in severe thrombocythemia (3 million/μL). In this condition, plasma potassium rather than serum potassium should be used. Long storage of whole blood specimens results in release of potassium from leukocytes and erythrocytes. 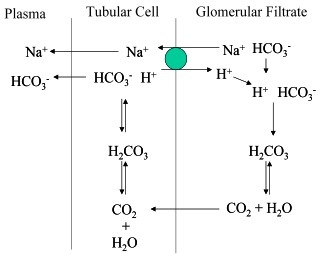 Refrigeration of the clotted sample will result in elevation of serum potassium and depression of serum sodium due to inhibition of the Na/K-ATPase pump. This process does not produce hemolysis. Renin is an enzyme produced, stored, and secreted by the juxtaglomerular cells of the kidney in response to low sodium concentration and decreased renal perfusion. Renin acts on angiotensinogen to produce the biologically inactive angiotensin I. Angiotensin-converting enzyme from the lung converts angiotensin I to the biologically active angiotensin II, which, in turn, stimulates the release of aldosterone. Aldosterone causes retention of sodium and water and excretion of potassium and hydrogen ion. The anion gap is influenced by changes of the unmeasured ions. 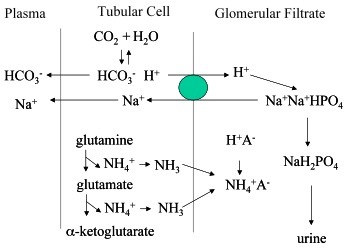 The most frequent change is an increase of the anion gap, indicating acidosis due to accumulation of acid metabolites (organic acids such as ketoacids; inorganic acids such as phosphoric acid, sulfuric acid) as in renal disease or uncontrolled diabetes. 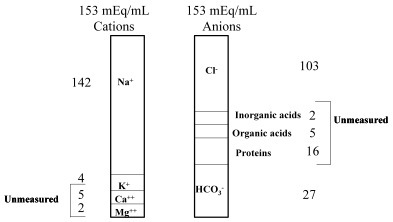 Less frequently a decrease of the anion gap is seen, which may be due to hypoproteinemia, the presence of a cationic paraprotein as in multiple myeloma, or an increase in calcium or magnesium (“undetermined cations”). Calcium, magnesium, phosphate, and protein are usually determined for reasons other than their role in electrolyte or acid-base balance. This analysis is based on the measurement of the freezing-point depression of water due to solutes in solution. Freezing-point depression is linearly related to solute concentration. When one mole of any nonionic solute is dissolved in a kilogram of water, the freezing point is lowered by 1.858°C. A mole of an electrolyte or ionic substance will lower the freezing point a multiple of this amount depending on how many ions are formed when the substance is dissolved. It must be emphasized that osmolality is usually measured on serum, not plasma, since anticoagulants such as EDTA, oxalate, fluoride, etc. contribute to osmolality (some as much as 155 mOsm/kg!). Heparinized plasma, however, can be used. The difference between measured osmolality and calculated osmolality is called the osmolal gap, which reflects unmeasured osmotically active substances that are present. A high osmolal gap suggests either the presence of another compound (e.g., ethanol) whose identity should be sought, or elevation of endogenous constituents that may not have been measured (e.g., proteins, ketoacids). The H - H equation indicates that the ratio of HCO3- / H2CO3 (which is normally 20/1) determines the blood pH. Any change, whether in the numerator (HCO3-) or in the denominator (H2CO3), will cause a change in pH. In metabolic acidosis, the H+ reacts with the bicarbonate component of the buffer system to form carbonic acid, which forms CO2 + H2O. The CO2 is removed by increased ventilation. In this reaction, HCO3- is lost (= bicarbonate deficit). RULE: for every 10 mm increase in pCO2 above normal of 40 mm, there is 1 mmol/L increase in bicarbonate above the normal of 24 mmol/L (mass action). Review Equation 9. RULE: for every 10 mm increase in pCO2 above normal of 40 mm, there is 3.5 mmol/L increase in bicarbonate above the normal of 24 mmol/L. Review Equation 9. Note: The compensatory increase/decrease in chloride “offsets” the corresponding changes in bicarbonate, thereby preserving electroneutrality. A febrile 84-year-old woman is brought from a nursing home to the emergency department of a local hospital. She is severely cachectic, confused, has sagging skin folds, and extremely dry skin. Admission chemistry tests are: serum sodium 168 mmol/L, serum potassium 6.2 mmol/L, chloride 130 mmol/L, and HCO3- 26 mmol/L. The serum osmolality is found to be 360 mOsm/kg of water. A urea nitrogen drawn at admission is 38 mg/dL and the patient’s hematocrit is 58%. Explain the elevated serum sodium and the elevated serum osmolality. What other laboratory studies are indicated? Explain the high hematocrit in this patient. Propose possible reasons for this patient’s abnormal laboratory data. A 40-year-old male presents to the emergency department confused and with the odor of alcohol on his breath. Chemistry tests performed at the time of admission show the following: serum sodium 137 mmol/L, potassium 4.2 mmol/L, chloride 100 mmol/L, and HCO3- 26 mmol/L. The urea-N was 14 mg/dL and glucose was 90 mg/dL. The serum osmolality, however, is 360 mOsm/kg of water. Propose a reason for the patient’s elevated serum osmolality. How would you test your hypothesis? Discuss reasons for serum hyperosmolality in the emergency department patient. Calculate the osmolality based on the above data. Assuming the elevated osmolality is due to ethanol, calculate the patient’s expected blood ethanol concentration. What is the nature and etiology of the acid-base disorder in this patient? Is there evidence for and expected degree of compensation for this disorder? Explain the low serum potassium. Is there evidence for abnormalities of electrolyte fluid balance? If so, how might such a disturbance impact serum potassium? Is serum K+ a good indicator of total body K+ for patients with acid-base abnormalities? What are the causes of the high pulse rate, low blood pressure, and high respiratory rate? Why is the serum chloride increased? The serum was strongly positive for ketones. Eight units of regular insulin were given IV and 8 units/h were given by IV infusion pump. Her serum glucose concentration fell at a rate of approximately 100 mg/dL each hour. In seven hours her ventilation and blood pH were normal following IV injection of NaHCO3 and vigorous fluid and electrolyte replacement. What is the nature and etiology of the acid-base disturbance? Is there indication for a normal compensatory response? What are serum ketones (ketone bodies)? How are they frequently detected? Explain the abnormal serum potassium result. Explain the low serum sodium result. What is the cause of the low BP upon admission? How does the low BP affect GFR (glomerular filtration rate)? Calculate the patient’s anion gap. Explain. Calculate the patient’s osmolality. Interpret. A 54-year-old male was admitted to emergency department with progressive weakness, somnolence, and shortness of breath 5 days after receiving chemotherapy (ifosfamide 2 g/m2) for recurrence of sarcoma. Past medical history included diabetes mellitus type II that was diet controlled. Initial labs: creatinine 3.5 mg/dL, K+ 2.3 mmol/L, Na+ 147 mmol/L, Cl- 122 mmol/L, glucose 400 mg/dL. Initial therapy included isotonic saline, 60 mmol of KCl and subcutaneous insulin. On day 2 similar labs as above were obtained. Blood gases were measured and an initial diagnosis of ketoacidosis was made. Patient was admitted to ICU with blood pressure of 120/60 mmHg and heart rate regular at 120/min. Respiration rate was 36/min, deep, and labored. The initial therapy included KCl and insulin. Why was the KCl necessary? Were any important lab results missing from the initial studies? How do you interpret the creatinine values? Calculate the anion gap for day 3. Does this support the initial diagnosis of ketoacidosis? What is the nature of this acid-base disturbance? Is there evidence of compensatory mechanisms? Propose a drug-induced mechanism for these laboratory results. Is this adverse reaction typical of this class of drugs? A 25-year-old woman with a history of surgical removal of an adenoma of the pituitary returns to her internist complaining of unquenchable thirst, and excretion of voluminous amounts of urine daily. Laboratory studies drawn in the physician’s office reveal the following: serum sodium 160 mmol/L, potassium 4.8 mmol/L, chloride 125 mmol/L and HCO3- 24 mmol/L. The patient’s serum osmolality is found to be 335 mOsm/kg of water. What further laboratory studies are indicated? What is the nature and cause of the acid-base disturbance in this boy? What are other causes of this type of acid-base disorder? What are the normal compensatory mechanisms in response to this acid-base disturbance? Is there evidence that these compensatory mechanisms are operative in this case? Differentiate compensatory responses in acute and chronic respiratory abnormalities of acid-base metabolism. What is included in the measurement of total CO2 in serum? Bicarbonate is generally included in the test panel: pH/blood gases. How is the bicarbonate value determined and what is its relationship to total CO2 in serum? Why is serum chloride decreased? Modified from Narins RG and Gardner LB, Simple acid-base disturbances, Med. Clin. North Am. 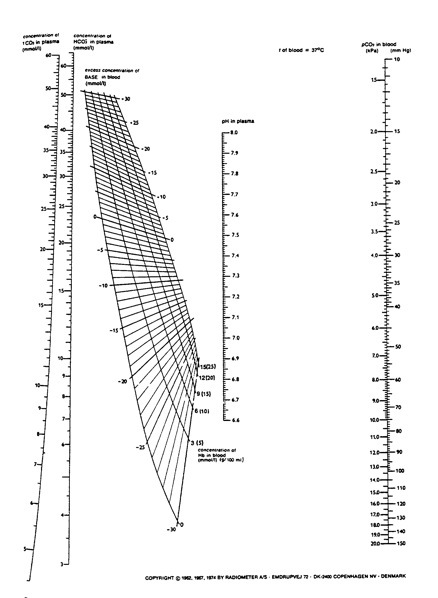 65:321-346, 1981 [Tietz Textbook of Clinical Chemistry, 3rd edition, table 32-4, p. 1115]. Does somebody knows a lab where I can send a sports drink to get the osmolarity? 1.Explain the elevated serum sodium and the elevated serum osmolality. 3.What other laboratory studies are indicated? 4.Explain the high hematocrit in this patient. 5.Propose possible reasons for this patient’s abnormal laboratory data. 1.Propose a reason for the patient’s elevated serum osmolality. 2.How would you test your hypothesis? 3.Discuss reasons for serum hyperosmolality in the emergency department patient. 4.Calculate the osmolality based on the above data. 5.Assuming the elevated osmolality is due to ethanol, calculate the patient’s expected blood ethanol concentration. 1.What is the nature and etiology of the acid-base disorder in this patient? 2.Is there evidence for and expected degree of compensation for this disorder? 3.Explain the low serum potassium. 4.Is there evidence for abnormalities of electrolyte fluid balance? If so, how might such a disturbance impact serum potassium? 5.Is serum K+ a good indicator of total body K+ for patients with acid-base abnormalities? 6.What are the causes of the high pulse rate, low blood pressure, and high respiratory rate? 7.Why is the serum chloride increased? 1.What is the nature and etiology of the acid-base disturbance? 2.Is there indication for a normal compensatory response? 3.What are serum ketones (ketone bodies)? How are they frequently detected? 4.Explain the abnormal serum potassium result. 5.Explain the low serum sodium result. 6.What is the cause of the low BP upon admission? How does the low BP affect GFR (glomerular filtration rate)? 7.Calculate the patient’s anion gap. Explain. 8.Calculate the patient’s osmolality. Interpret. 1.The initial therapy included KCl and insulin. Why was the KCl necessary? 2.Were any important lab results missing from the initial studies? 3.How do you interpret the creatinine values? 4.Calculate the anion gap for day 3. Does this support the initial diagnosis of ketoacidosis? 5.What is the nature of this acid-base disturbance? 6.Is there evidence of compensatory mechanisms? 7.Propose a drug-induced mechanism for these laboratory results. Is this adverse reaction typical of this class of drugs? 1.What further laboratory studies are indicated? 2.What is the most likely diagnosis? 1.What is the nature and cause of the acid-base disturbance in this boy? What are other causes of this type of acid-base disorder? 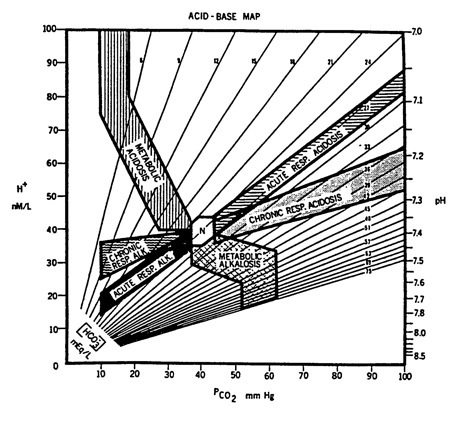 2.What are the normal compensatory mechanisms in response to this acid-base disturbance? 3.Is there evidence that these compensatory mechanisms are operative in this case? 4.Differentiate compensatory responses in acute and chronic respiratory abnormalities of acid-base metabolism. 5.What is included in the measurement of total CO2 in serum? 6.Bicarbonate is generally included in the test panel: pH/blood gases. How is the bicarbonate value determined and what is its relationship to total CO2 in serum? 7.Why is serum chloride decreased?